A new consumer survey from ChangeWave shows that four in ten people who are thinking about buying an e-book reader are planning to get Apple’s iPad. And more than one in four people who had previously purchased a different device say they would have gotten the iPad if it had been available when they shopped. ChangeWave Research polled 3,171 consumers to gauge interest in the iPad and to find out how the iPad might impact the budding e-book reader market. Overall, 4 percent of people are “very likely” to buy the iPad after its release, and 9 percent say they are “somewhat likely” to do so. The comparable numbers for the iPhone before its release in 2007 were 3 percent “very likely” and 6 percent “somewhat likely.” So, it would seem the iPad has even more pent-up demand. 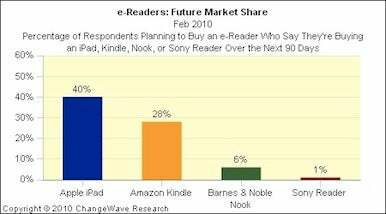 Looking at future market share for e-book readers, the iPad, with 40 percent, is well ahead of its second-place competitor, Amazon’s Kindle, which is expected to come in around 28 percent. Barnes and Noble’s Nook is down at 6 percent, and the nearly forgotten Sony Reader comes in at just 1 percent. But obviously, the iPad is much more than an e-book reader, as ChangeWave’s survey also demonstrates. Likely buyers were asked to list their top uses for the iPad, and reading e-books comes in third, after surfing the Web and checking email. The survey doesn’t address how the iPad will impact the burgeoning market for tablet computers. 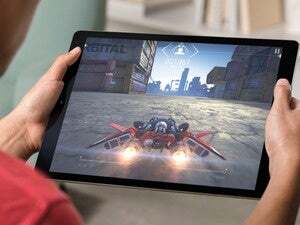 But in one possible cautionary point for Apple, one in four likely iPad buyers state they will hold off on the purchase of another Apple product to get their hands on the iPad. After all, there's only so much disposable income to go around. Of course, you should approach all consumer surveys with at least a little skepticism. After all, a survey released a month ago showed that people’s interest in the iPad declined significantly after Apple’s announcement. What does it all mean? Apple may indeed have a hit on its hands with the iPad, but no one can say for certain until the thing hits the streets on April 3.